quick to disappear; fleeting: the fugitive effects of light. The word is derived from Late Middle English: from Old French fugitif, -ive, from Latin fugitivus, from fugere ‘flee’. This fleeting (fleeing) quality is often attributed to life. In terms of paint, at least in terms of the specialist terminology used by the manufacturers of paint for artists, the word fugitive denotes a colour that lacks permanence, a colour that will fade with time. Permanent colours are distinguished by the word permanent in their names e.g. Permanent Green Light. Issues of durability and the fugitive nature of colour in life seemed prominent in my first discussions when I visited researchers working in structural colour at the University of Sheffield Department of Physics in their laboratories last week. Other topics were also discussed, but for now I would like to focus on this basic dichotomy. In the print above we can see an image of the Australian green tree frog, simply called the green tree frog in Australia, White’s tree frog, or dumpy tree frog (Litoria cerulean). It is a species of tree frog that is native to Australia and New Guinea. Note the generic name: cerulean, a term used in classical times to denote blue pigments. One caption to this image reads that the ‘specimen sent to the illustrator was blue because of the preservative’. In actual fact this is probably not true. The Australian green tree frog is blue in death because the cells that confer greenness act only in life. 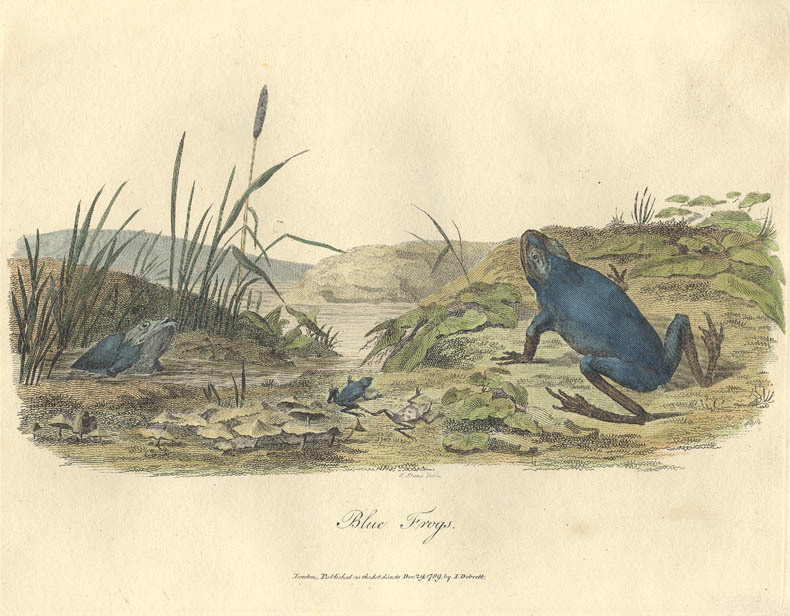 The underlying structure – the structural colour – of the frog is actually blue. Structural colours are not like pigments or dyes, they impart their effects upon the human eye due to the scattering of light by nano structures – tiny plates or ribbed structures – within the organism. These structures, often present in bird feathers and butterfly wings, are often composed of keratin, an amazingly durable protein that infers a kind of deathless, lasting, permanence on the colours that we perceive when we look at these beautiful things. Keratin is stubbornly hard to dissolve and Stephanie, one of the researchers, made reference to her ‘table of death’ – a catalogue of life-threatening chemical processes that she sometimes needs to extract meaningful substances from these hard, fibrous biological materials for examination and analysis. Another organism that was presented to me by Andrew at this first meeting, was a white scarab beetle (Cyphochilus insulanus). Several members of this family of beetles have structurally coloured wing cases which act as left-handed circular polarisers; this was the first-discovered example of circular polarization in nature. In these cases, the underlying mechanism is the product of molecular-level spiral-shaped forms within the chitin – another astonishingly durable biological material, this time derived from glucose, that comprises the beetle’s exoskeleton. In ancient Egyptian mythology, the sun god Ra is seen to roll across the sky each day, transforming bodies and souls. Scarab beetles roll dung into a ball as food and as a brood chamber in which to lay eggs that are later transformed into larvae. For these reasons the scarab was seen by the ancient Egyptians as a symbol of this heavenly cycle and of the idea of rebirth or regeneration. Although our white scarab beetle probably hails from South East Asia, he certainly bears an appropriately death-like pallor. These are just a few thoughts gleaned from a long discussion about the nature of colour. A discussion that led me to think deeply about living colour’s permanence and impermanence, of the dance of light across living materials that are sometimes fugitive, like the biological dyes that give Litoria cerulean its impermanent light green, and sometimes apparently immune to the passing of time, like the polarising spirals within the dung beetle’s pallid chitin.